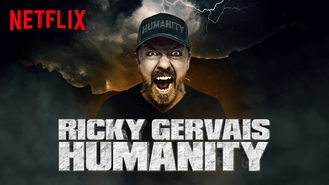 Ricky Gervais: Humanity (2018) on Netflix India. Check worldwide Netflix availability! If Ricky Gervais: Humanity isn't available in your country, or you are visiting a country where it isn't, there is still a way to watch it! In his first special in seven years, Ricky Gervais slings his trademark snark at celebrity, mortality and a society that takes everything personally. He's not a big fan of people, actually. But they give him such great material. A sharp-tongued star unloads on humanity.